The historic Carnival of Ivrea is a one of a kind event that attracts many tourists every year. It is a great celebration, during which the community of Ivrea celebrates its capacity for self-determination, recalling an episode of liberation from tyranny that goes back to the Middle Ages. The legend says that a baron who starved the city in the XIII century was driven away thanks to the rebellion of the daughter of a miller (Violetta), betrothed to Toniotto, who refused to submit to the jus primae noctis imposed by the tyrant to all brides. She climbed the castle and beheaded the Baron which lit the popular uprising; that ended with the destruction of the building. The building was never rebuilt with the establishment of the free city. The Battle of the Oranges recalls this rebellion: the people, represented by nine teams of orange throwers on foot, fought with oranges against the armies of the feudal lord, represented by shooters on horse-drawn carriages, wearing caps and masks reminiscent of ancient armor. Their weapons are oranges. In the battle, which now takes place on February 7, more than 4000 shooters on foot are divided into nine teams and more than 50 horse-drawn carriages (with 10 or 12 shooters on board) for a total of about 5000 people involved. There are particular ceremonies during the days of celebration: the obligation for participants to wear a red cap (both to remind the French revolutionaries and to not become the target of oranges), the historical procession on the evening of Shrove Tuesday, the festivities on Friday, the presentation from the balcony of the Town Hall of Violetta, fireworks on Saturday and, of course, the battle of the oranges on Sunday. All participants – men, women and children regardless of their role – wear uniforms that recall perfectly the historical periods to which the event refers. There is even a band with Pipes and Drums which marches at the head of processions. 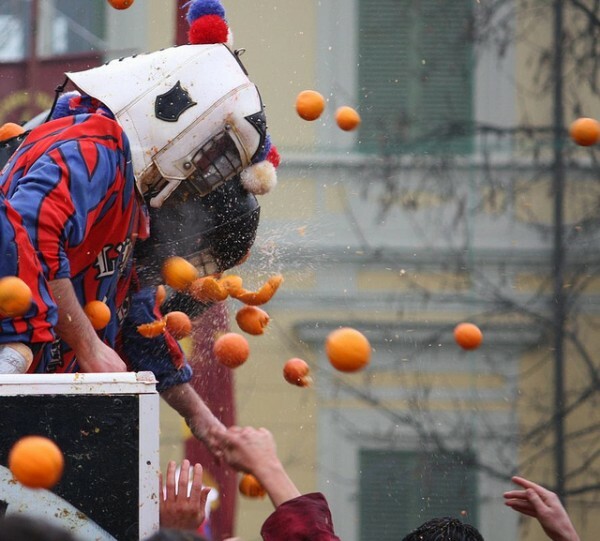 However, the most well-known and spectacular moment of the event remains the battle of the oranges. It takes place in the main squares of Ivrea among carts that follow the parade and teams on foot. A commission rewards the teams of orange throwers that have stood for courage, throwing technique, and loyalty. Tourists attending the battle are theoretically protected from the blows of oranges by high wire mesh. All shooters share unwritten rules of chivalry: there is loyalty, respect, sportsmanship. This is a peaceful demonstration and although sometimes people get hurt, everything ends with a handshake. The battle is undoubtedly the most spectacular element of the event representing the fight for freedom, a symbol of the Carnival of Ivrea. Anyone can take part by enlisting in one of the nine teams on foot or becoming a crew member of a cart. In the two Sundays before the real event there are ceremonies and parades.